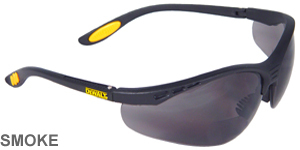 DeWalt Bifocal Reading Safety Glasses are protective glasses and reading glasses all in one. Meets ANSI Z87.1 + 2003 high impact standards and have hard coated, scratch resistant, impact-resistant polcarbonate lenses. Provide 99.9% UV protection. DeWalt Bifocal Reading Safety Glasses Reinforcer Rx Clear Lens 1.0 DPG59-110D Are Reading And Safety Glasses All In One. Magnification Power 1.0. DeWalt Bifocal Reading Safety Glasses Reinforcer Rx Clear Lens 1.5 DPG59-115D Are Reading And Safety Glasses All In One. Magnification Power 1.5. DeWalt Bifocal Reading Safety Glasses Reinforcer Rx Clear Lens 2.0 DPG59-120D Are Reading And Safety Glasses All In One. Magnification Power 2.0. DeWalt Bifocal Reading Safety Glasses Reinforcer Rx Clear Lens 2.5 DPG59-125D Are Reading And Safety Glasses All In One. Magnification Power 2.5. DeWalt Bifocal Reading Safety Glasses Reinforcer Rx Clear Lens 3.0 DPG59-130D Are Reading And Safety Glasses All In One. Magnification Power 3.0. DeWalt Bifocal Reading Safety Glasses Reinforcer Rx Smoke Lens 1.5 DPG59-215D Are Reading And Safety Glasses Combined. Magnification Power 1.5. DeWalt Bifocal Reading Safety Glasses Reinforcer Rx Smoke Lens 2.0 DPG59-220D Are Reading And Safety Glasses Combined. Magnification Power 2.0. DeWalt Bifocal Reading Safety Glasses Reinforcer Rx Smoke Lens DPG59-225D Are Reading And Safety Glasses Combined. Magnification Power 2.5.